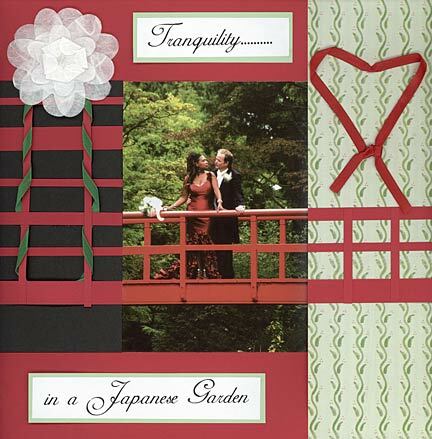 This one of my wedding scrapbook layouts is of a moment of quiet in the midst of a memorable, action-packed day. Wedding scrapbook layouts could just as easily feature the 'action-packed' bits though! HAVE YOU EVER HAD 'SCRAPPERS' BLOCK'?! Every time I think about making a layout I um and ah for ages, not knowing how to start it. I might have some great photos, maybe even some great embellishments but I can't get a handle on the 'big picture' - literally. I am therefore hugely grateful to Jen Gormley's superb book ' '500 Scrapbooking Sketches' ', that has a ton of great layout frameworks that bust through my scrapper's block every time! What a lot of time I might have saved. Hey ho. I chose for my font the by David Rakowski. It was the closest thing I could find to match the photo's mood. As you can see, I took the red Japanese bridge out of the confines of the photo and led it across the page. This gave me a 'playground' for embellishments where I could run the ribbon up one side and top the right hand side with a 'heart' (of sorts!). GOT TO HAVE WHITE SOMEWHERE! As Rosalind was wearing a sensational crimson dress, I wanted to include white on this page somehow, as you would on most wedding scrapbook pages . I therefore made a carnation from three pieces of white tissue paper by Paper Mojo. You may want to consider scrapping wedding cards, or one of many other great wedding craft ideas. Another avenue for you might be to collect wedding poems for scrapbooking. My daughter read a wonderful poem at our wedding - which I wanted to include in our scrapbook. Wedding scrapbook layouts might just get you hooked on this hobby, so why not seek out some help. You'll find wedding page kits, wedding papers, and a host of wedding embellishments - enough for a banquet! Well, even if not enough for a banquet, certainly enough wedding scrapbook ideas to help you create a wonderful wedding scrapbook to make your special day live for ever for you, your family, and your descendants.